In the period between 2006 and 2015, ordinary workers saw their incomes rise by an average of just 2% a year while billionaire wealth rose almost six times faster. Last year, one billionaire was created every two days. This is the biggest increase in the number of billionaires in history and a whopping 82% of all of the wealth generated between the second quarter of 2016 and the corresponding period last year went to the top 1%, according to the latest survey by Oxfam. There are now 2,043 dollar billionaires worldwide. The wealth of this group increased by $762 billion in just 12 months and Oxfam has calculated that approximately two-thirds of that wealth is the product of inheritance, monopoly and cronyism. On the flip side, while the poor aren't getting poorer, the bottom 50% of the global population bagged less than 1% of total wealth in 2016-2017. Given that the global adult population is estimated to be 5 billion and children (under 18) are pegged at 2.5 billion-for its analysis Oxfam conservatively assumed that the children are distributed equally across the adult distribution and share the wealth of their parents/guardians-the bottom 50% represents 3.7 billion people. In the period between 2006 and 2015, ordinary workers saw their incomes rise by an average of just 2% a year while billionaire wealth rose almost six times faster, adds the charity, an international confederation of 20 organizations networked together in more than 90 countries focussing on global poverty alleviation. The report, fittingly, was released just hours before the start of the World Economic Forum, which will reportedly focus on how to create "a shared future in a fractured world" this year. India is no stranger to income inequality, but the gap is widening further. Last year's survey had showed that India's richest 1% held 58% of the country's total wealth, which was higher than the global figure of about 50%. According to the latest survey, the wealth of this elite group increased by over Rs 20.9 lakh crore during the period under review-an amount close to the total expenditure estimated in the Union Budget 2017. 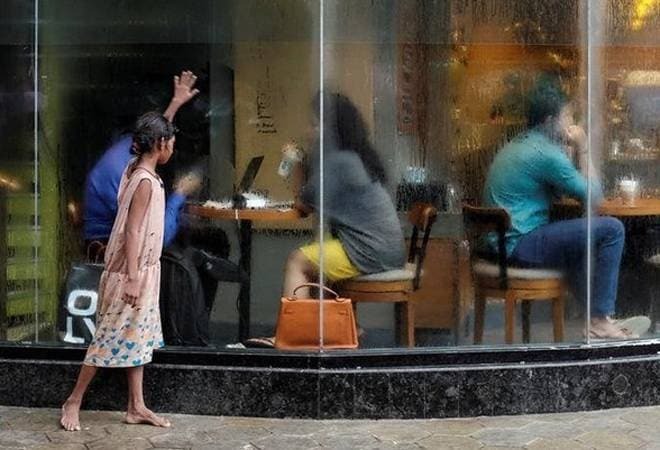 India's top 1% of the population now holds 73% of the wealth while 67 crore citizens, comprising the country's poorest half, saw their wealth rise by just 1%. "The billionaire boom is not a sign of a thriving economy but a symptom of a failing economic system. Those working hard, growing food for the country, building infrastructure, working in factories are struggling to fund their child's education, buy medicines for family members and manage two meals a day. The growing divide undermines democracy and promotes corruption and cronyism," said Oxfam India CEO Nisha Agrawal. Things certainly have gone very awry if, as the survey finds out, it will take 941 years for a minimum wage worker in rural India to earn what the top paid executive at a leading Indian garment firm earns in a year. The report titled 'Reward Work, Not Wealth', also sheds light on gender inequality. "While in most countries the gender pay gap has received more attention, the gender wealth gap is usually even higher," it says, adding that women provide $10 trillion in unpaid care annually to support the global economy. Oxfam furthermore makes several recommendations to start fixing the problem of income inequality. On the government's part, it has asked for things like promoting inclusive growth by encouraging labour-intensive sectors that will create more jobs, imposing higher tax on the super-rich, implementing policies to tackle all forms of gender discrimination and sealing the "leaking wealth bucket" by taking stringent measures against tax evasion. The report reveals that the top 1% is evading an estimated $200bn in tax. More significantly, developing countries are losing at least $170 billion each year in foregone tax revenues from corporations and the super-rich. Can Indian corporates manage even a part of this?